Raj Sheelvant (Project Manager at Intel): "If you manage a team and would like to understand different aspects of rewards/motivations, I urge you to read this book!" Fadi El-Eter from PM Hut: "[the book] offers an in-depth and unique perspective on the issues of reward and motivation faced by project managers"
Dr. Casey Wilson, Director of eLearning (Lancaster University Management School, UK): The literature review demonstrates a very clear and comprehensive understanding of the literature domain. [...] An excellent piece of work [which] adds value to the field of reward, motivation and project management." Carpe Factum: "Thanks for providing this resource!" One achievement of this book was the development of the so-called Reward House. The Reward House is a simple model explaining the most important points that need consideration building a reward system. 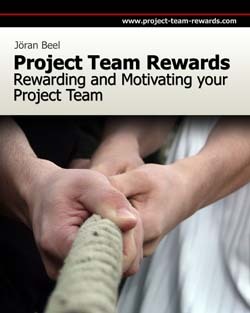 This book gives you a comprehensive introduction to rewards in general and project team rewards in particular. Motivation theories and their impact on designing an effective and efficient reward system are explained. Throughout the book six so-called ‘reward questions’ are considered that need to be answered for designing a reward system. These reward questions are: Rewarding or not rewarding? Whom to reward? What to reward? What kind of reward? How much reward? When to reward? In addition, impacts of variable factors that may influence the answers to the reward questions are identified and explained. Some of those factors are employee’s age, the company’s culture but also project characteristics such as the project’s goal clarity, applied success criteria, project duration or member fluctuation. After reading this book, you will not know the universally valid best reward practice that fits for every project team and every project. Such a best practice just does not exist in rewarding as also shown in the book. Instead, the book provides you with profound information that will help you developing your own good reward practice for your unique project and your unique project team. Finally, this will lead to higher project team members’ motivation and therefore higher probability of project success. Primarily, the book’s target audience are project managers and line managers. Project managers shall be sensitised to the numerous aspects that need consideration for designing a reward system in general. Line managers shall be sensitised to the differences between line and project work and resulting differences in designing a reward system. In addition, this book is for interested students, professionals, and of course researchers in the field of team rewards and project team rewards respectively. Please note, that this book originally was written as a Master’s Thesis. Accordingly, you should not expect to read a ‘normal’ text book but a Master’s Thesis. Any comments on this book are most welcome. Please do not hesitate to contact me.